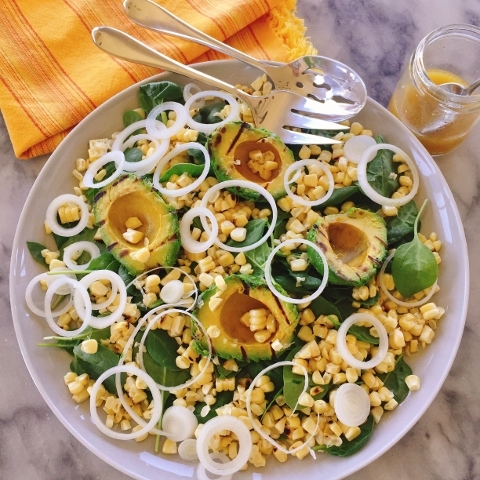 Grilled Avocado & Sweet Corn Salad - Recipe! - Live. Love. Laugh. Food. 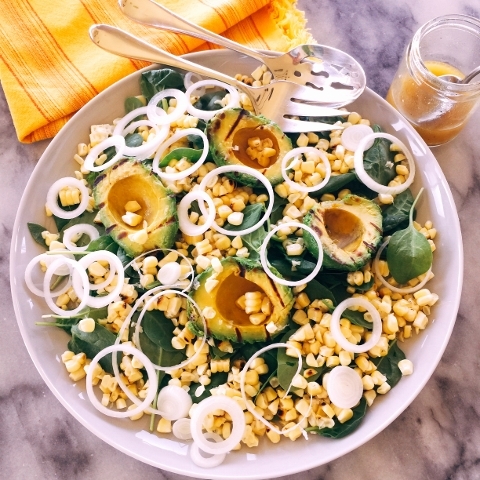 Grilled Avocado & Sweet Corn Salad – Recipe! Grilling avocados is a new thing for me. I have used fresh avocados in dips, salads and even brownies, but I have never actually grilled them, until today. 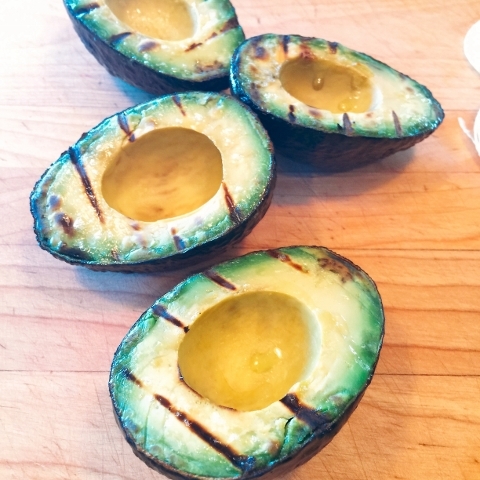 When you grill an avocado, it warms slightly from the heat and leaves charred marks across the top, which creates nice flavor and presentation. Grilled sweet corn is a favorite of mine too, especially in the summer months when you can get it straight from the farmer’s market and combining both grilled avocados and corn is flat out fabulous. In this recipe, I create a quick honey mustard vinaigrette to spoon over the top, which adds a slight tang to the warm salad. Fresh spinach is a nice green to cut the richness of both the avocados and corn and a few spring onions, add another layer of summer fun. 1. Heat grill to 375 degrees. Slice the avocados in half and remove the seeds. Husk and rinse the corn. 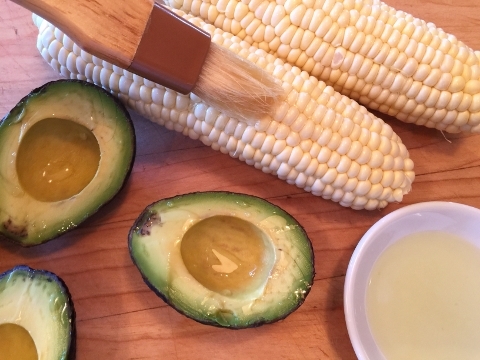 Brush the avocados tops and corn with oil. 2. 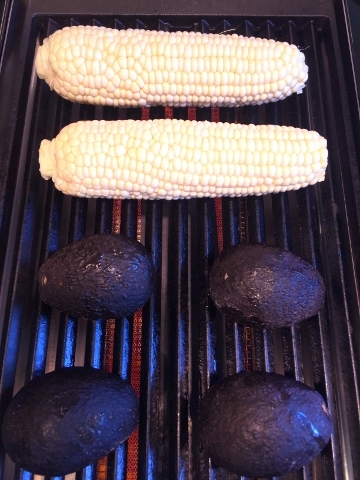 Place the avocados and corn on the grill. Cook the avocados for about 3-4 minutes, just until slightly charred. 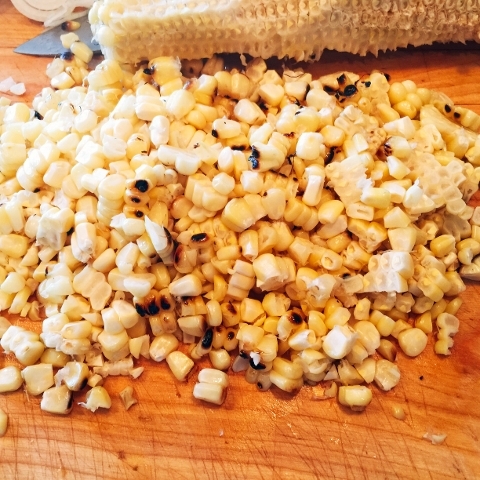 Continue to cook the corn for 5-7 minutes longer or until the kernels are slightly charred. 3. Let the corn cool, while you prepare the vinaigrette. 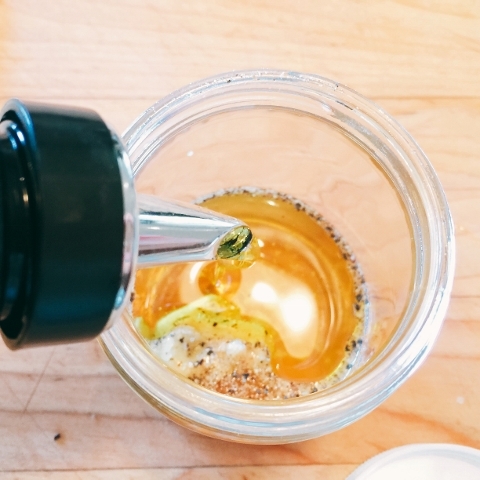 In a sealable jar, add the vinegar, honey, Dijon, a pinch of salt and pepper and the olive oil. Shake the jar, until the vinaigrette is slightly thickened. 4. 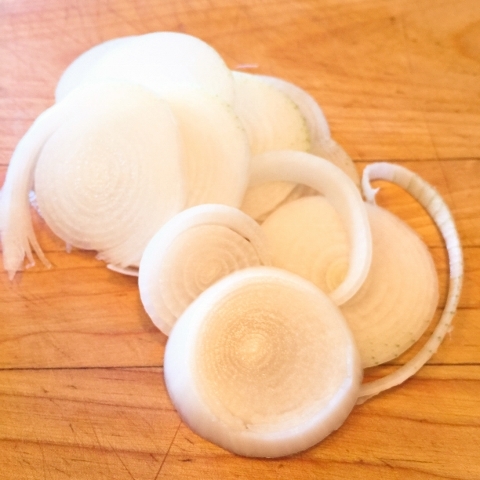 Slice the onion thinly, and set aside. Place the spinach on a large serving plate or platter. 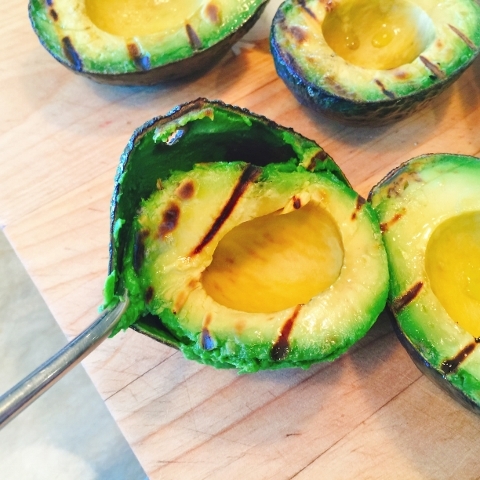 With a soup spoon, remove the avocados from their skins. 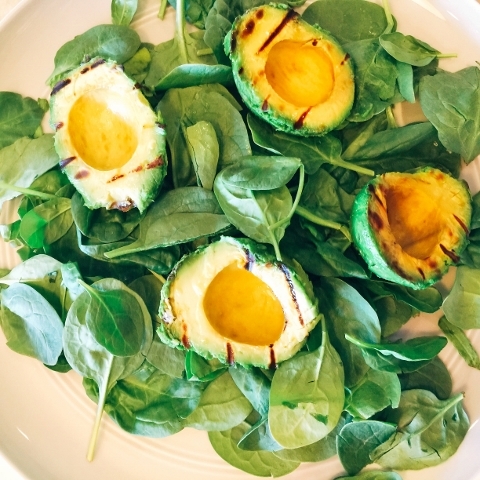 Place the avocados on top of the spinach. 5. Slice the kernels of corn off the cobs and sprinkle them across the spinach leaves. Then, spread the rings of onion on top of the corn. 6. 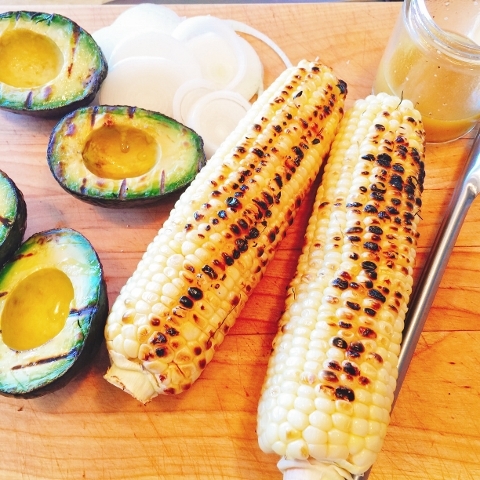 Serve the Grilled Avocado & Sweet Corn Salad with the vinaigrette on the side. To make this a heartier meal, slice grilled chicken breasts over the top. Enjoy! 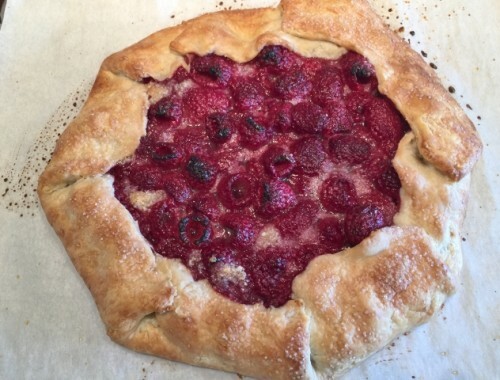 Rustic Raspberry Tart – Recipe! 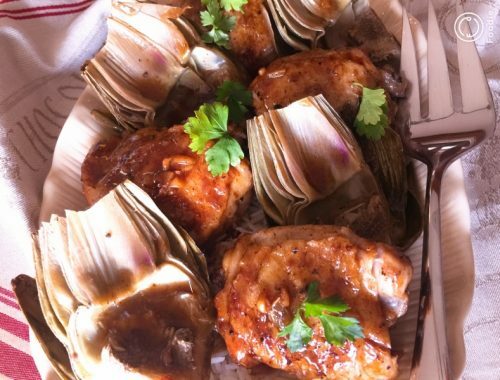 Instant Pot Vinegar Chicken & Artichokes – Recipe! 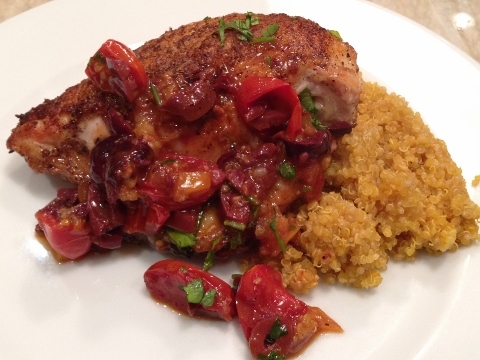 Moroccan Chicken with Preserved Lemon, Olives & Tomatoes – Recipe!